Inverter circuits are very much helpful to produce high voltage using low voltage DC supply or Battery. 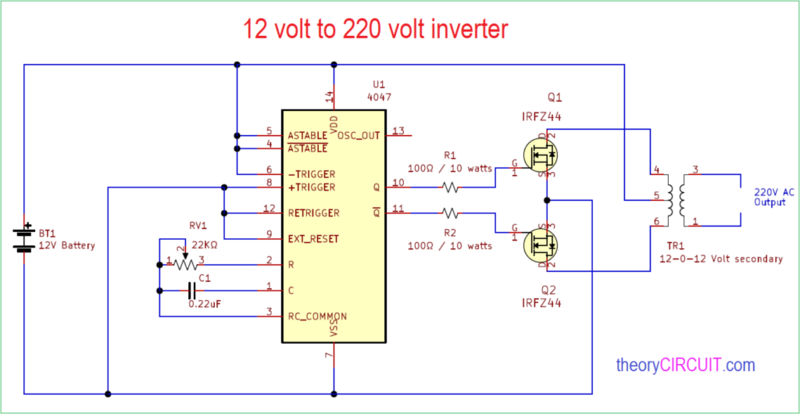 Here 12 volt to 220 volt inverter circuit designed with few easily available components and also it can be easily built on general purpose printed circuit board. Basic operation of this type inverter is switching pulse and step up transformer, hence the IC CD4047 acts as a switching pulse oscillating device and n channel power MOSFET IRFZ44n acts as switch then 12-0-12V secondary transformer inversely used as a Step up transformer. power MOSFET IRFZ44 = 2. This simple 12 volt to 220 volt inverter circuit consist of switch device and step up transformer, As we know high switch frequency pulse reaches the step up transformer then the output voltage will reach high value due to the mutual inductance. IC CD 4047 is configured in astable multivibrator mode with the help of variable resistor RV1 and capacitor C1, by varying the value of Variable Resistor we can get different range of output pulse at Q and Q’ pins and it results variation of output voltage at the transformer. N channel power MOSFETs IRFZ44 Drain pins are connected with the transformer secondary pins and common pin in the secondary winding is connected with battery positive bias, both MOSFET source pins are connected to the negative bias of battery and these MOSFETs are driven by Q and Q’ output from IC CD4047. When alternate square pulse drives the MOSFET switches then secondary winding forced to induce alternate magnetic field and this magnetic field induce large (primary) winding of transformer and produce high alternate voltage. (Here normal 1 amps 12-0-12V transformer is inversely used as a step up transformer). Note: This circuit involved in handling of High AC voltage handle with extreme care.